One hears sounds, sounds mixed together, but does not understand the meaning of what is said. Youths who have acquired this unpleasant dialect of merely animal sounds, whether they come from the cities or the country, should make every effort in school to acquire a human, natural speech possessed of character and soul and to rid themselves of their peasant or shrieking back-alley dialects. Following the French Revolution, many of the European elite feared conflict between the upper and lower classes. In Germany, for example, consistorial official Johann Gottried von Herder delivered a speech entitled “On the Education of Students in Language and Speech,” which according to Friederich Kittler, was “again and again hailed as the founding document of German as a school subject” (37). In the speech von Herder called for oral standardization, which he believed would lessen the language divide between the classes. Naturally, the literate upper classes assumed theirs was the standard pronunciation others were to emulate. In a British context, this push toward oral standardization in the education system correlated with the rise of poetry recital in the nineteenth-century Victorian classroom. In The English Common Reader, Richard Altick describes an early nineteenth-century England where both church educators and Benthamite officials became increasingly convinced of the correspondence between “ignorance” and crime rates. Following Adam Smith, who argued that increasing specialized labor resulted in workers who lacked powers of discrimination, both government and religious officials began to see social and political advantage in being able to shape young minds. In 1833 the government allotted the first public funds for education, and while there was limited government financial support for the next four decades, the British and Foreign School Society and the National Society for the Education for the Poor both formed during this period to promote the nationalization of public education. Interest in standardizing English was a large part of the call for official education. British writer Francis Newman wrote in 1869: “[the primary teacher] should teach pure correct sounds, and cultivate both ear and tongue. The national importance of this is great. Coarse, plebeian utterance, sticking to men through life, splits the nation into two castes” (qtd. in Vincent 59). For Liberals such as Newman, the rhetorical move was toward greater unity through the acquisition of standard spoken language. While not going so far as to allow that children could transgress their social standing, proponents of standardized speech did suggest that children might better themselves, and, at the least, avoid criminal activity through official education. Gill’s Introduction exemplifies the wider sentiment that education was to overcome the language of ignorance, and instill proper accentuation in pupils. There was much debate about how literacy was to be taught, but in the early half of the century both Church and public schools generally used syllabic and spelling methods to teach literacy. Teachers broke words down into letters or syllables, children were taught how each should sound, and parts were later put together into whole words. The letter came first, the sound and meaning after. David Vincent finds that by the end of the eighteenth century it was accepted that, in theory, pronunciation should where possible follow spelling, which in practice meant that “the language of the London merchant class became the touchstone by which all the dialects of popular culture were judged and found wanting” (80). In the classroom, monitors and teachers spelled words aloud as they wrote them on the board, and then each monitor repeated the word to its class, who in turn pronounced it as they inscribed the letters on slates or sand trays. Official sanction of the ‘Look and Say’ method of teaching pronunciation correlated with growing emphasis on poetry recitation in the classroom. The Revised Code of 1862 set up inflexible nation-wide assessment standards for any school that received government subsidy. According to these standards, at level four of reading proficiency, students were required to memorize and recite four lines of poetry from a school reader. At level seven, students were to recite a passage from Shakespeare or Milton. Poems were ideal for teachers using this method of teaching, as words were presented in context, and according to Catherine Robson, created a “profound physical and emotional connection” between text and the lived experience of the human body (95). 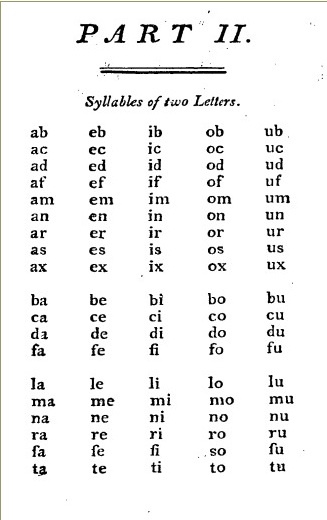 As well, the metrical regularity and rhyme schemes of classroom poetry likely made it easier to memorize and recite. Whether or not poetry recitation “improved” standard pronunciation in the period, its status in the classroom certainly draws attention to the oral nature of literacy and social mobility in the Victorian period and to the place of poetry in everyday life. Altick, Richard. The English Common Reader: Social History of The Mass Reading Public, 1800-1900. 2nd Edition. Columbus: Ohio UP, 1957. Print. Kittler, Friedrich A. Discourse Networks 1800/1900. Trans. Michael Metteer. Stanford UP, 1990. Print. Robson, Catherine. “Felicia Heman’s ‘Casabianca.’” Heart Beats: Everyday Life and the Memorized Poem. Princeton UP, 2012. Print. Talbot, James. The Christian school-master: Or, The duty of those who are employed in the publick instruction of children: especially in charity-schools. To which is added, a collection of prayers upon several occasions, for the use of the master and scholars. Together with directions and instructions concerning confirmation; and suitable devotions before, at, and after it. London: Printed for F. and C. Rivington, booksellers to the Society for Promoting Christian Knowledge, 1757. Eighteenth Century Collections Online. Web. 25 October 2013. The Silver Primer, or, First Book for Children. York: James Kendrew, n.d. University of Washington Digital Collections. Web. 29 November 2013. 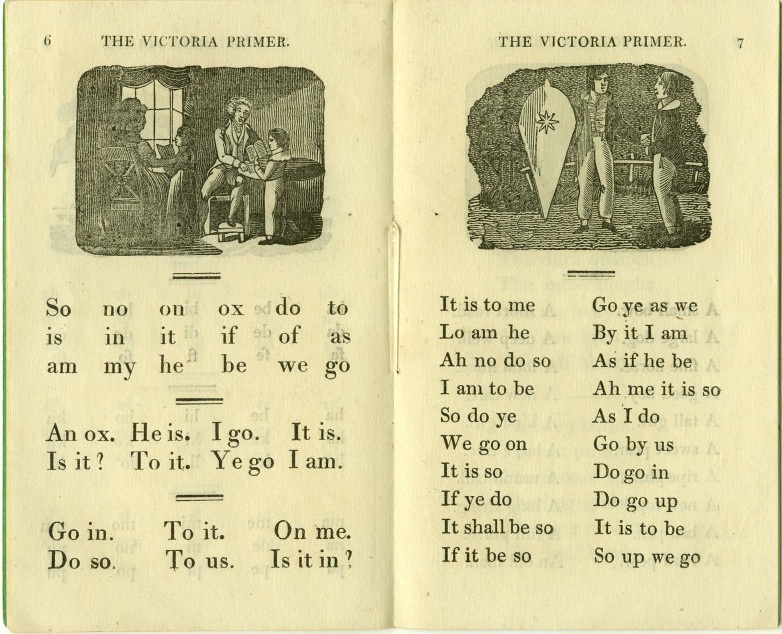 The Victoria Primer, or First Book for Children. York: James Kendrew, n.d. University of Washington Digital Collections. Web. 29 November 2013. Vincent, David. Literacy and Popular Culture: England 1750-1914. New York: Cambridge UP: 1989. Print. Smith’s theories led to the general feeling that if the masses could spend time in the classroom, they “could be permanently immunized against Jacobism, radicalism, subversion, blasphemy, atheism and every other ill to which they were exposed by the east wind of social change” (Altick 141). These factions, according to Altick, were divided along religious lines, the former being non-sectarian and Benthamite, the latter having Anglican affiliations” (145). Indeed, as Altick points out, conservatives such as Soame Jenyns cautioned against education that would “elevate [children’s] minds above the rank they are destined to fill in society” (143). David Vincent argues that these were the venues where we can register pressure for educational reform (84). David Vincent speculates that the Victorian classroom would have been “filled with the sound of the human voice” (79).